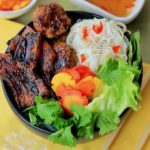 Vietnamese bún chả is a vibrant mix of grilled pork, crisp salad, and resilient rice vermicelli, all united by a light yet potent sauce that is an ideal meal for any day. 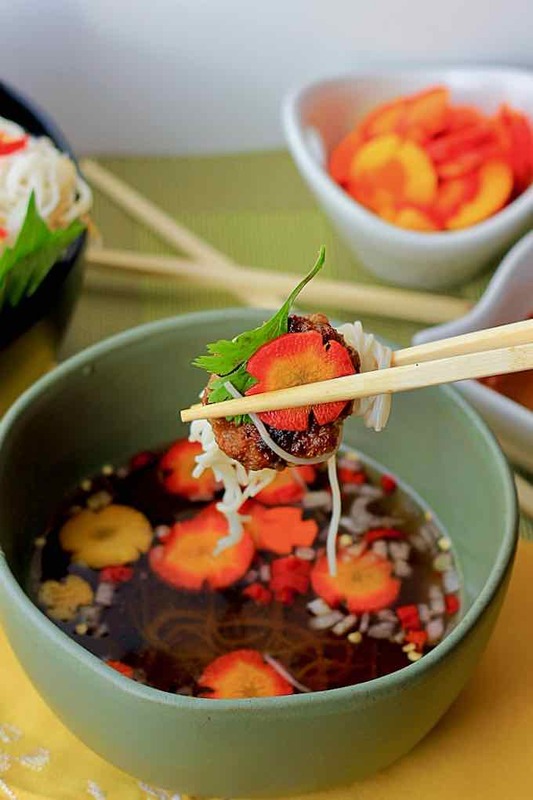 When we think of Vietnamese food, the first thing that pops into our mind is pho. Pho might be Vietnam’s most famous and well known dish, but bún chả is the top choice with it comes to street food in the Land of the Blue Dragon. Just look for the clouds of meaty smoke after 11 a.m. when street-side restaurants start grilling up small patties of sizzling, seasoned pork and slices of marinated pork belly over a charcoal fire. If you can’t find the smoke, follow the tantalizing smell of grilled pork. In the past few years, Vietnamese food has become more and more popular around the world. 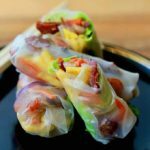 While most of us may have tried the two best known Vietnamese dishes, bò bía (Spring rolls) and bread rolls, rice noodles, fresh vegetables and herbs all play big roles in Vietnamese food, making it one of the healthiest cuisines in the world. It is a known fact that Vietnamese food is one of the most healthy and balanced in the world. The ingredients used in Vietnamese cuisine can cover all the dietary needs on protein, lipids, carbohydrates, vitamins and minerals because there is a great natural diversity of agricultural products. It is this diversity and variety that are the foundations of a healthy and balanced lifestyle with the people of Vietnam. 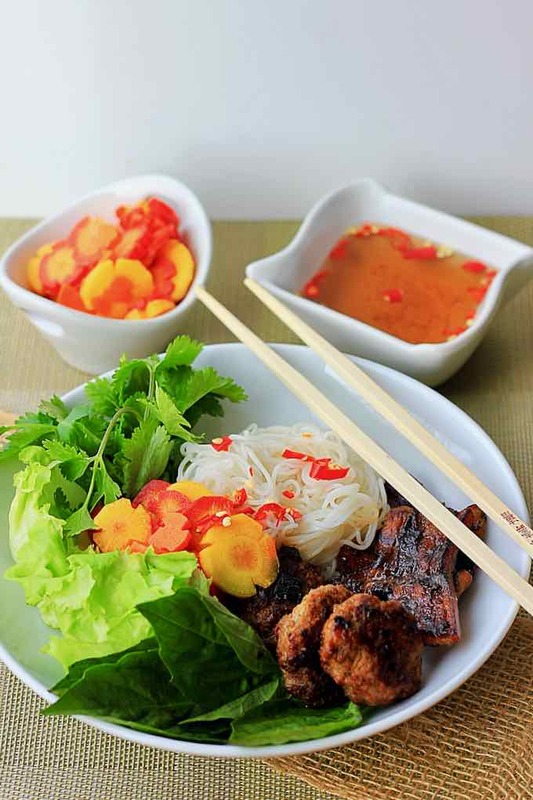 Bún chả is a Vietnamese dish of grilled pork, noodles and a heaping of pickled vegetables. Bún chả is served with grilled fatty pork (chả) over a plate of white rice noodle (bún) and herbs with a side dish of dipping sauce. Fresh vegetables and herbs are an essential part of Vietnamese food, and you’ll get large bowls served alongside almost every meal. Bean sprouts, mint and cilantro are the most common, as well as pickled vegetables. 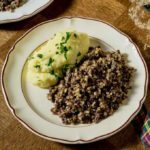 This is the sort of recipe that’s terrifically versatile in that it will work well with many types of vegetables. Shredded cabbage or lettuce, or other leafy greens. Finely sliced cucumber, green beans, red radish, cherry tomatoes, even asparagus. Most fresh vegetables will work great in this. Vietnamese eat a lot of crisp vegetables with their meals as it helps with digestion. There’s a saying that Vietnamese eat with all their senses and it makes a lot of sense with bún chả. First, you smell the mouth-watering grilled pork patties and pork belly sizzling with the occasional “pop” when the melting fat hits the grill or pan. Just imagine a plate of pearly white rice vermicelli, a heaping pile of all sorts of greens, a bowl of dipping sauce with some sliced pickled carrots and green papaya, and of course, those beautifully charred pork pieces. 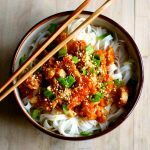 Grab a pair of chopsticks and take some rice noodles to dip into the sauce. A perfect bite consists of a bit of noodles, a piece of pork and a slice of pickles; all well soaked. As soon as the bite hits your tongue, you will taste how perfectly balanced in sweetness and sourness that dipping sauce is, how the noodles wonderfully complement it, how crunchy and tangy the pickles cut through the fatty pork and how the marinated pork just melts in your mouth. 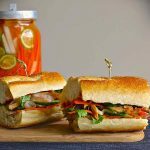 What is the origin of bún chả? From the name, bún chả Hà Nội originated in Hanoi, Vietnam. After phở, bún chả is one of Hanoi’s most famous dishes. Even though it originated in Hanoi, it is also a popular dish in other Northern cities. This dish can be found at every corner of Hanoi, from big streets to small alleys. In Vietnam, people enjoy bún chả for breakfast, lunch or dinner. Vietnamese cuisine doesn’t win any points for complexity. 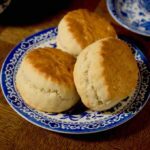 Many of the most popular dishes can be made just as well on the side of the road as in a high-end restaurant. Restaurants or street food stalls selling bún chả usually look modest with basic plastic tables and chairs. Even though you can find this dish on the menu of fancier restaurants, it is recommended that you go to the places the locals go to eat bún chả. Even Chef Anthony Bourdain chose a street food shop to treat the former President Obama to bún chả in his Parts Unknown series. 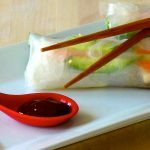 How do you eat bún chả? The way to eat food is also a very important factor that can influence the nutritional value of food. Eating with chopsticks, using multiple dishes, and sharing with people allows you to eat more slowly, to chew the food longer and in the end causes a better digestion and assimilation of nutrients, without overloading the digestive system. Bún chả is definitely one of those dishes that you share and eat family style. In bún chả, the meat is separated from the noodles. In fact, the meat is actually sitting in the dipping sauce. 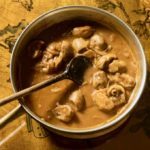 One way to enjoy this dish and also the most Hanoian is to use chopsticks to pick up some noodles, dunk them into the sauce and then eat with meatballs and herbs. 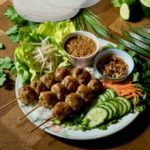 Another way is to add the noodles, lettuce and herbs to a serving bowl, spoon over the dipping sauce with meatballs into the bowl, and then eat. 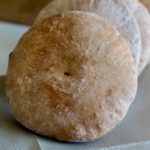 Regardless of the way you choose to eat it, one bite will light up your taste buds with many flavors, aromas and textures. Sauces are a very important part of the Vietnamese food experience. A meal without sauces is like a meal without pasta in Italy. 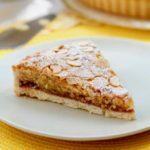 As with other Asian cuisines, it’s all about the yin and yang; the sweet and the salty, the cooling and the warming, the fresh and the fermented. You need the sauce to slurp up the noodles. Most salt intake in the Vietnamese diet is delivered in the form of fish sauce. 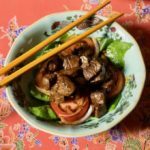 Salty, funky, fermented fish sauce, or nước mắm in Vietnamese, is used in marinades, soup broths, salad dressings, spring roll dips, and it’s really hard to think of any dish where it’s not used. The national condiment is nước chấm, made of fish sauce that’s diluted slightly with a splash of lime juice, sugar, chilies and garlic. Vietnamese food makes extensive use of fresh herbs, spices, and aromatics. Sometimes they go into a steamy pot of phở or sometimes they are wrapped into spring rolls. Bún chả is a balance of vegetables and herbs, with protein, which for me, is the epitome of good eating and a timeless recipe. Bún chả is a delicious Vietnamese dish made from grilled pork over rice noodles, and served with a side dish of dipping sauce. In a large glass jar, combine the vegetables and salt and set aside for 15 minutes. Rinse and dry the vegetables with a cloth. In a jar, dissolve the sugar in the rice vinegar. Add the slices of carrot, green papaya and white turnip. In a saucepan, boil some water. Cook the dried rice vermicelli as indicated on the package. After cooking, drain the vermicelli and place under cool running water until lukewarm. Drain, and arrange the vermicelli in a large dish. Mixing all the ingredients of the sauce. Add a few slices of reserved carrots, turnips and green papaya to the sauce. Separate all the ingredients in half to marinate the 2 meats. 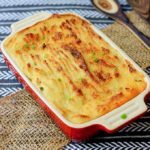 In two containers, marinate the pork belly and ground pork shoulder separately with finely chopped red onion and garlic and all the meat marinade ingredients except the oil. Mix well. Pour the tablespoon of oil into the ground pork shoulder meat. Mix well. Form small meatballs the size of a ping-pong ball, flatten them a little, and set aside. In a skillet, heat 2 tablespoons of vegetable oil over medium-high heat. Brown the meatballs well on both sides. In another skillet, heat 2 tablespoons vegetable oil over medium-high heat, then lower to medium heat and brown the pork belly slices on both sides. 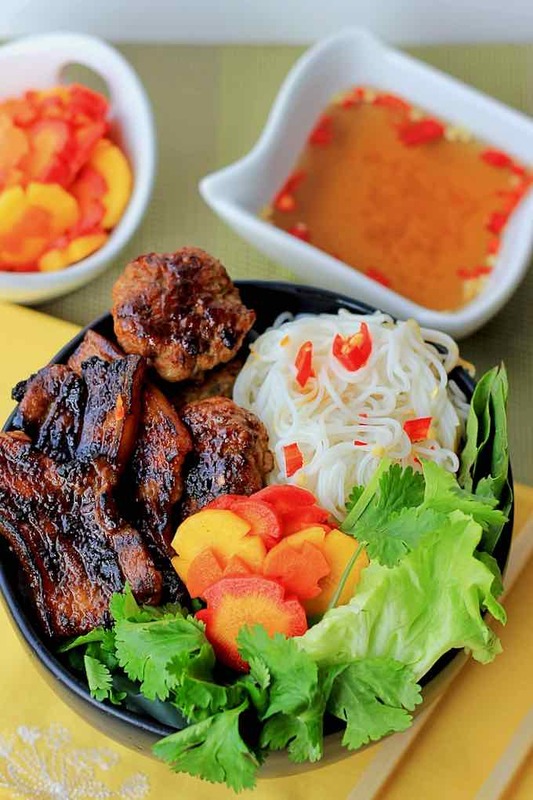 Arrange the meats, rice vermicelli, aromatic herbs and romaine salad in a large dish. In the large dish, place a small bowl of sauce with a few slices of carrots, turnip and green papaya. Bún chả is frequently served with spring rolls.